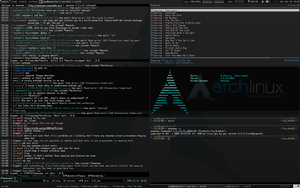 archlinux - please read this and this — twice — then ask questions. Very nice! Think you could link me to your .awesomerc, and any other things you used to get that desktop? Also, what version of awesome do you use? This is the Zombie Screenshots Thread That Will Not Die!